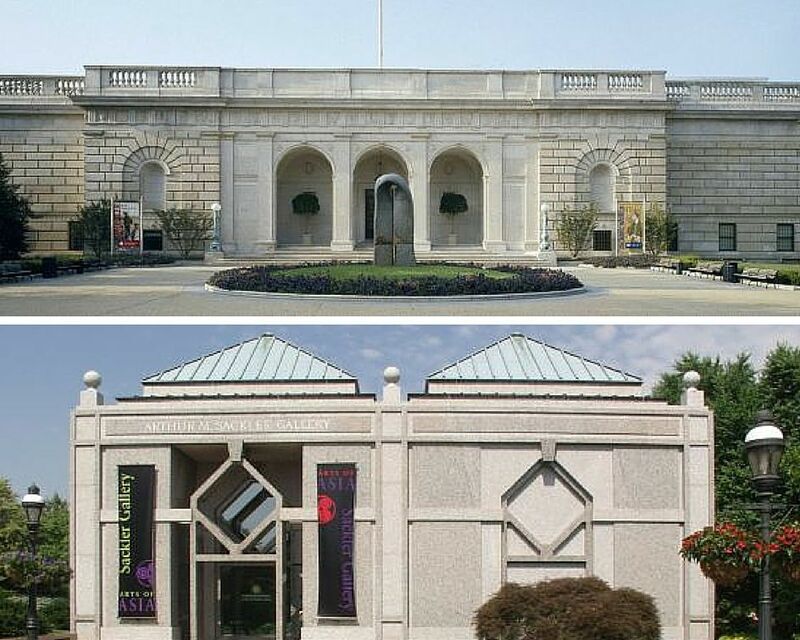 The Smithsonian Freer Gallery of Art and the neighboring Arthur M. Sackler Gallery together form the national museum of Asian art for the United States. The museums are located on the National Mall in Washington DC. The Freer Gallery features a world-renowned collection of art from China, Japan, Korea, South and Southeast Asia, and the Near East that was donated to the Smithsonian by Charles Lag Freer, a wealthy 19th century industrialist. Paintings, ceramics, manuscripts, and sculptures are among the favorites of the museum. In addition to Asian art, the Freer Gallery houses a collection of 19th- and early 20th-century American art, including the world's largest number of works by James McNeill Whistler (1834-1903). The Arthur M. Sackler Gallery features a unique collection that includes Chinese bronzes, jades, paintings and lacquerware, ancient Near Eastern ceramics and metalware, and sculpture from Asia. The gallery opened in 1987 to house more than 1,000 Asian art objects donated by Dr. Arthur M. Sackler (1913-1987), a research physician and medical publisher from New York City. Sackler also gave $4 million toward construction of the gallery. Since 1987, the gallery's collections have expanded to include 19th- and 20th-century Japanese prints and contemporary porcelain; Indian, Chinese, Japanese, Korean and South Asian painting; and sculpture and ceramics from Japan and South and Southeast Asia. Both the Freer Gallery and the Sackler Gallery present a full schedule of public events, including films, lectures, symposia, concerts, book readings and discussions. Public tours are offered daily except Wednesdays and public holidays. There are special programs for children and families, and workshops to assist teachers incorporating Asian art and culture into their curriculum. Hours: Open daily except December 25. Hours are from 10 a.m. until 5:30 p.m. The Freer Gallery and the Sackler Gallery each have their own gift shop offering a selection of Asian jewelry; antique and contemporary ceramics and textiles; cards, posters and reproductions; recordings, and a wide selection of books for children and adults about the art, culture, history and geography of Asia and other areas related to the museum's collection. The Freer and Sackler Galleries house the largest Asian art research library in the United States. The library collection consists of over 80,000 volumes, including nearly 2,000 rare books. It is open to the public five days a week (except federal holidays).